A winsome face belies subterranean nervous energy in this warm weather Chardonnay. Pretty aromas of pear, apple and hazelnut are caressed by lemon highlights. In the mouth the creamy introduction morphs into a pure spring-water seam that sits on top of a granular foundation. A kiss of shy oak appears on the medium length finish that shows bitter herbal notes and a snap of electric minerality. Very dry and crisp, it is textural complexity that makes this wine appealing. The kinetic, granular texture emerges slowly making the wine seem strident like a string drawn too tightly, suggesting pent up potency despite the ingratiating smile. Sun kissed but not too ripe, a bit of oak but restrained, this wine is neither underdressed nor overdone. A good effort. 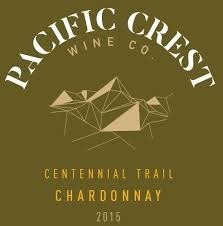 Pacific Crest Wine Co. is a division of Wine Trees and AWDirect, a wine conglomerate with a global reach specializing in developing innovative brands. Kraftwerk’s Vitamin HD isn’t pretty but it captures the electric energy of this wine.